This is SO nice Nina. You look stunning. Love the sleeves of the top! My mum bought a gorgeous neon colour block sari from him for my reception too. His clothes just make you feel amazing and the fitting was soooo good! I actually preferred wearing this lengha over my Sabyasachi bridal lengha ( that was to do with the the really ill fitting blouse the tailor at Aashni & Co made- I’ll post more on that later! ) fitting is everything!!! If you email me on theasianfashionjournal@aol.com I’ll let you know what I paid for the lengha. It’s def cheaper than buying from stores here but you have to factor in costs of travelling and staying in India to your overall cost. If you can I would recommend going to India though because there’s SOOOOO much more choice- I’m really happy that I bought my wedding trousseau from Mumbai. I am OBSESSED with your blog! I just got engaged and it is going to be an Indian / Military multicultural wedding and I am so lost on where to go for trousseau shopping in the states. 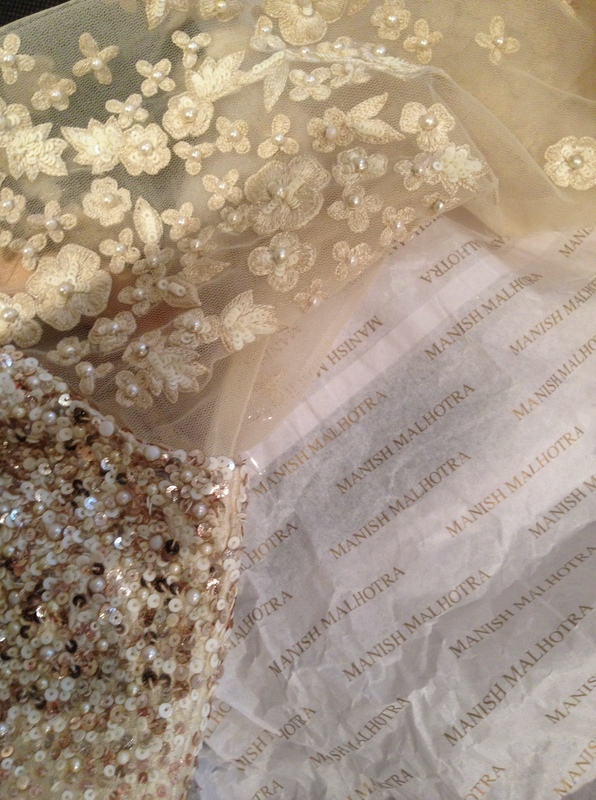 The Manish Malhotra dress that you wore for your civil ceremony is gorgeous — do you have any idea if it’s possible to order from their store from the United States? Im currently in medical school and don’t know when I’ll get enough time off to go to Mumbai. 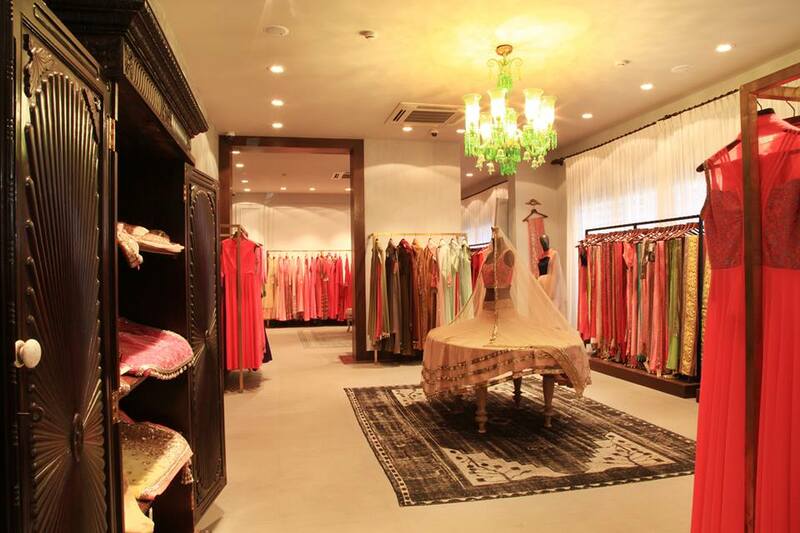 Also, do you have any other recommendations for online designer bridal trousseau shopping websites that NRI brides can use? Keeping doing what you do!! You have such incredible taste! I would say there’s real limitations and big risks when ordering on-line (although I know its possible). I tried on the lengha in store then gave the order & their sales assistant took my measurements. The biggest risk aside from bad fitting is that you only know if the style suits you when you try it on. I had real fixed ideas on my wedding outfits before I started shopping and it turned out that what I ended up buying was completely different! and that happened because I was able to try on so many different styles. Hey Nina, I’m so sorry about be randomness but I came across your blog while looking for info on the BIBI store in London. 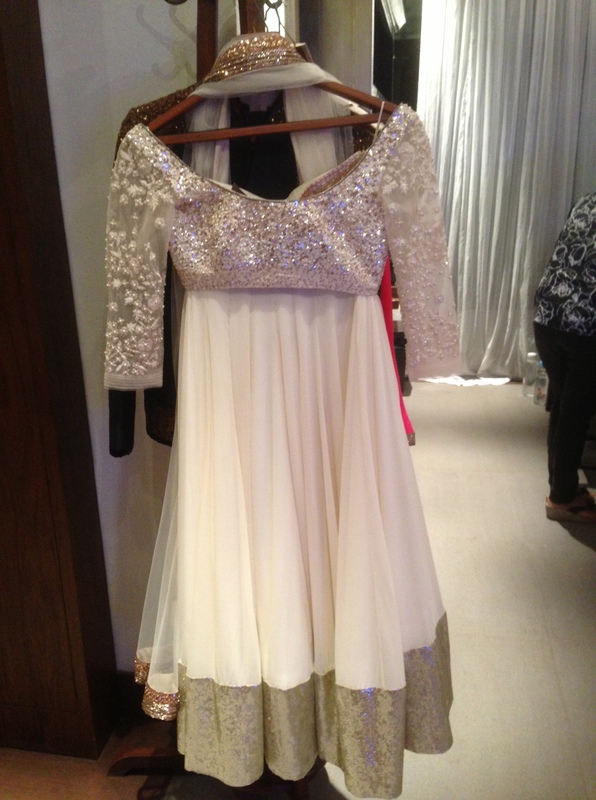 I happened to see the picture if the ivory lehenga you wore to your civil ceremony. I’m getting married next year, and am quite confused about what to wear to my civil, hindu and reception events (all on the same day!). As yourself, I’m not going to wear a proper white dress for the civil (that’s just not me! ), and I would like to imagine myself in something similar to what you had worn. As a fashion blogger.. Do you think you could maybe help me out on ideas a little? Also, if it’s not too much to ask would you be able I tell me what you wore for the hindu (if you had one) and reception events? Thanks! Any help would be muuuchhhh appreciated here! Thanks for getting in touch. Yep, it can be hard to know where to start with bridal shopping! I wore a sari from Bibi London for my engagement, an Arpita Metha for my Mehndi, Mainsh Malhotra for my civil (above), Sabyasachi lengha for my Hindu ceremony and Varun Bahl for my reception. If you put those designer names in the search box at the top of my blog- you’ll be able to see what their work is like. Do you have a budget in mind for your wedding outfits? I can suggest some places to go to based on that. Oh wow! That sounds amazing! Your wedding pictures must be amazing with the variety of outfits :-). My budget is around 2k. I don’t know if that’s on the conservative side or not, but it’s what I can justify at the moment. I was actually thinking of having 2 outfits – one for the ceremonies, and the other for the evening reception (OR one for the civil and the other for the Hindu ceremony & evening reception). I’ve been looking at stuff to get an idea, but am so confused it’s just ridiculous! Sorry for the late reply. I’ve been chasing the sun in Marbella! Just remember that U.K civil ceremonies are super short as in half an hour max! so if you do opt for something different to wear for your Civil maybe budget a smaller amount to that outfit as you won’t be in it for very long. I had my civil on a different day to the Indian wedding and had a sit down lunch after that’s why I decided to splurge because I was in it for a few hours! Your budget seems more than ok to me! It all depends on the style of clothes you like. The heavier the embroidery and embellishment generally means the higher the price. I LOVE IT!!! Fab, fab, fab! What a beautiful, elegant, classy outfit! BIG FAT CONGRATULATIONS to you, Nina! And your line up of outfits sounds like it was made by every bride’s DREAM TEAM of designers – Arpita Mehta, Sabya and Varun Bahl! You musttt send me pictures! I’ll have to inbox you pics! the rest of the pics aren’t going on line!